It’s a pleasure to be able to interview you, how are you finding 2013 so far? Have you been out on the bank much? I always remember you saying on one of the shows that you look to see if the sheep or cows are feeding in the fields and use that as a guide for how the fishing will be. What has been one of the most useful tips you’ve heard over the years? Nature is quite a remarkable thing and if you see grazing animals not grazing, chances are most of our prey won’t be either. Not all though because it can be a good sign for predators, including chub and, of course, perch and pike. There are thousands of tiny things that go towards having a good or bad day at the waterside that can be construed as tips but one piece of advice I give to anglers, especially those less experienced, is: “Do what you know, not what you think you know.” I am especially picky about knots, so another good tip is to learn good knots and tie them well! In a recent article in the AT, Dave Harrell had some interesting views on the closed season. What are your thoughts on that? Frankly, Dave, and others who feel the same, are being selfish by wanting to fish during the time when MOST species spawn. The old National Rivers Authority, the precursor to the EA Fisheries Dept, conducted exhaustive research which concluded that river species form large spawning conurbations, often travelling long distances – miles – to gather in the same areas every year to spawn. Targeting them at the wrong time could have disastrous consequences, in their report, to an entire year class of fish. Make no mistake, while some anglers would respect this, many wouldn’t as there is a cult of ‘catch at all costs’ running throughout angling, in my experience. The same type of angler will target spawning carp in lakes, in some instances happily foulhooking them, especially if it will win a match. We don’t like to admit it but I’m sure many of us have experienced it. It’s possibly no coincidence but of all our ‘river’ species, the least successful spawners are barbel. They are also the latest spawners so perhaps there is a case for lengthening the close season. There certainly is NO case, apart from selfishness, to abolish it in my opinion, living, as I do, less than 400m from a very prolific stretch of River Thames! You seem to have a go at everything on Tight Lines. What is your favourite method of fishing and venue? A REALLY tough ask. Stickfloat fishing for roach and dace on a pacy river, drifting cut baits for tarpon in Key West, casting flies at dorado/mahi-mahi in the same place, stalking permit on the Florida reef with crabs, waggler fishing for roach in winter on commercial carp fisheries, lure fishing for pollack and cod from a boat, or bass from the shore, or perch in a river. Not keen on most forms of legering…Is that too many? Hahahaha. Do you think that river fishing is having any kind of resurgence or do you think most people are happy fishing on commercials? You must be pretty busy with your weekly Angling Times articles, presenting Tight Lines and your radio shows. What do you get up to outside of fishing? Haha, not much! Going on holiday… I have two trips to the Florida Keys with my wife each year, PLUS the infamous ‘Boys’ Trip’ to Key West when we fish 14 days solid. I come back to work for a rest! I also have two ‘long weekends’ away around the time of my birthday and that of my wife, when Nigel Botherway sits in on Fisherman’s Blues for me. I’m back for Tight Lines though – and I write my column wherever I am in the World. I watch as much football and cricket as I can – on the box and am an ardent Gooner of LONG standing. I went regularly until sitting down became compulsory. I must admit, I’ve never heard the radio show as it is on so early. Do you like early mornings? Lazy SOD! Don’t you go fishing? Mostly, yes. It’s the getting tired bit early in the day that does me though. I honestly cannot recall the last time I was in bed after 8am; it is MANY years! I’ve just finished the Frank Barlow book and I’m currently reading the Ivan Marks book, who are your angling heroes? The best angler I ever met was Peter Burton, a brilliant match angler who caught some big fish by design too, but that’s not the question! Frank Mundus, the ‘Monster Man’ who made shark fishing in the USA big business and on whom the character of Quint in Jaws was based. Ernest Hemingway did it how I’d like to! Roy Marlow is an angling genius – but for gawds sake don’t tell him I said so. Why is nothing simple? 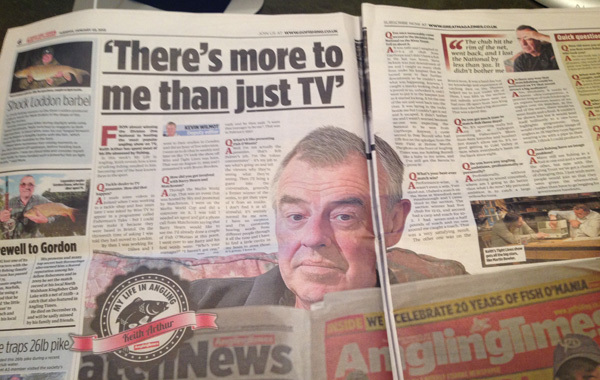 Good read, can imagine Keith has forgotten more about fishing than I know! Some times commercial fishing is too easy and it is hard to remember what fishing used to be like when you were ecstatic just to catch a fish!